Have you ever made a New Year’s resolution, only to find that by February you are back to your old habits? If you are like 99% of people your answer is probably a resounding YES! We all know the feelings of guilt, frustration and failure that result from this reoccurring pattern and most blame themselves and their lack of ‘willpower’ for their lack of success. The thing is, without support and strategy, big changes can be really hard to implement and succeed at alone. How would it feel to have a team of health professionals behind you to make 2015 the year of change for you? What could we assist you to be or do differently, to make this coming year your year for success and transformation? Four renowned Sunshine Coast health experts have created an amazing package specifically tailored to support you in making those changes and sticking to them! 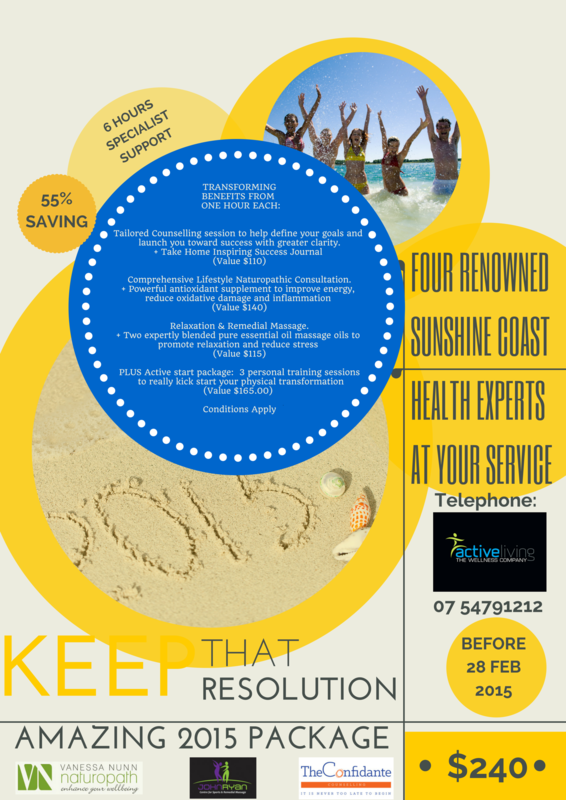 This total care package will support your body, mind and soul and assist you to kick start your 2015. *This package is only available for purchase until 28 February 2015 and for use until 30 June 2015. There are a limited number of packages available. and they will guide you to your next step on the road to lasting change!